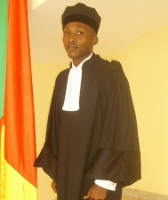 Gautier Zomissi is a general business and intellectual property lawyer who has been practicing in Cameroon since 2000. Mr. Zomissi has spent considerable time over the course of his ten year legal career developing his skills as a business and intellectual property attorney by receiving a graduate diploma in intellectual property law in 2004 and a masters of business law in 2005 both from the University of Yaounde II. Mr. Zomissi furthered his education by receiving his PhD in business law in 2007 from the University of Ngaoundere and is currently finishing up his diploma in banking, stock market, currency and finance capital markets law at the same institution. Mr. Zomissi’s business legal career is marked by many accomplishments including negotiating business contracts, conducting tax, banking, and intellectual property litigation, as well as managing intangible assets of enterprises and providing general legal assistance to businesses and individuals. One of his most successful legal endeavors was to establish a professional civil society called BRAINTRUST which specializes in protecting intellectual property rights of individuals. Mr. Zomissi has also been extensively involved in working and helping inmates on a daily basis in Cameroon’s prisons. He has frequently represented them in court and through these experiences developed complex understanding about their daily realities and struggles. Through this work, he was inspired to design his JusticeMakers project to combat the daily difficulties faced by inmates. The Project: Cameroon’s judicial system is plagued by non-communication between the essential actors in the criminal system which often leads to blockages and slowdowns in executing criminal proceedings. This lack of fluid and seamless communication between these actors often results in inmates being imprisoned for periods extending well beyond their sentences as well as inmates being held in pretrial detention for excessively long periods of time. Inmates have been imprisoned without knowing their trial date or a way to communicate with judicial officials to confirm their date. Additionally, detainees who have been acquitted or fully served their sentence remain incarcerated because judicial officials are delinquent in establishing their release due to communication breakdowns between different actors in the system. Furthermore, communication issues extend beyond inmate incarceration lengths to include judges and parties who are unable to call key witnesses to testify because they cannot be located or arrestees unable to exercise their right to contact their attorney because judicial officials and inmates lack communication resources to reach their attorney. The combinations of these problems often lead to compromises in defendant’s rights. Creation of an office to ameliorate the communication between detainees and the Cameroonian judiciary. However, this required institutional partners whose contributions were essential. The first step was to involve APRODH. Accordingly, two resolutions were adopted with the Association: acceptance of their administrative and financial duties. Finally, the resolutions were materialised when IBJ awarded the associations the 2010 Justice Makers prize and an attestation was delivered to Cameroon allowing the project to continue to the second step. Administrative Authorisation: The project could not have been possible without access to prisons as it was necessary to assess the situation from within. Therefore, linking up with the relevant authorities and partners was crucial in order to gain permission. While waiting for a response from potential partners, they received word from the statesmen that they would get the backing of the state and were encouraged to continue establish and furnish an office. Recruitment and training of volunteers:They recruited three volunteers: two lawyers and one secretary. Following the recruitment, the training took place over 10 days. Following the training, Krishna Gagné, a lawyer from Canada was sent by IBJ to oversee the project. After carrying out the task given by IBJ in July 2011, the project was halted in August as it had not been given authorisation to access the prison by the Ministry of Justice. However, after consulting their partners, they were able to gain access to the prisons from September of the same year. Investigation to identify detainees held in prisons without valid legal justification: This was the most intense and compelling, yet rewarding step of the project. Accordingly, investigations took place in the two largest prisons in Cameroon in order to identify every case of unjustified detention. As they did not have the administrative authority, it was necessary to work covertly. After assessing the figures, they were shocked by the numbers as the they remained constant despite efforts made the government to ameliorate the incarceration rate. The figures show that the prison has made no effort to control the prison population since 2010 (more than 3500 detainees). Throughout the month of September, the group primarily worked in the two quarters that they were particularly shocked by the detention conditions. Regarding the actual work, namely the investigations to identify people whose detention did not appear unjustified, and those whose procedures were almost blocked, they soon realized that it was not possible to aid in these detainees. This was due to the small staff number, the clandestine nature of the investigation, as well as the limited resources.However, they had the idea of ​​working with the prisoners themselves, who were very receptive. So, they trained some detainees on the spot and distributed the investigation cards and began to collect information. The supervision of this operation was done with the assistance of volunteers of the APRODH. They were able to gather near 2000 records of investigations. They prioritized detainees under the age of 18 and those who have tried all avenues without a result. Accordingly, two teams were created to deal with each category. The first team found some success. The second team also were able to start new proceedings for some of the detainees. However, the activity was very limited. As the project encountered several issues, they created an analytical directory of problems and due diligence for the detainees of the prison. Further, they have also made a phonebook of 70 prisons in Cameroon, lawyers and bailiffs. In addition, as of 31st of January, they have contributed to the liberation of 61 detainees and enrolled 8 cases at the Appeal Court.